Atlanta lawyer and journalist Josie Duffy Rice speaks at a Los Angeles Pop-Up Magazine show. 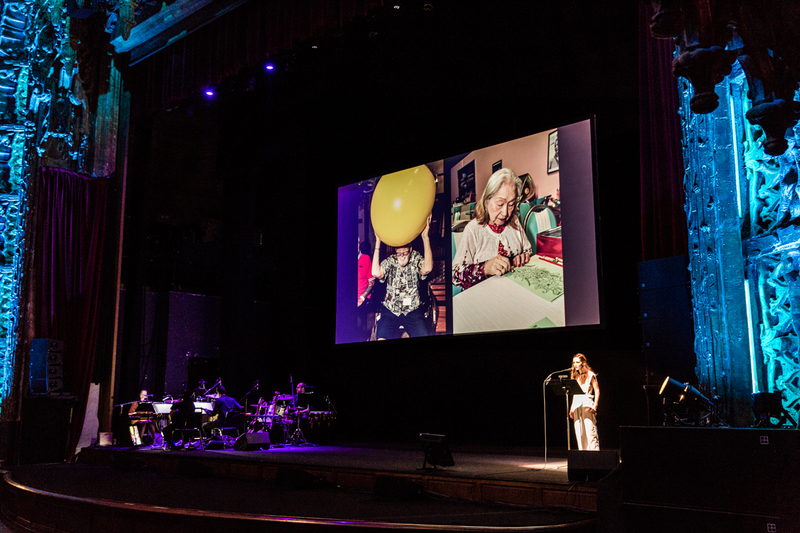 National award-winning California Sunday Magazine brings its live show, Pop-Up Magazine, to the Variety Playhouse on February 11. In the last 10 or so years, the San Francisco-based production has played at venues from New York’s Lincoln Center to the Ace Hotel in Los Angeles—building a bit of a cult following, especially among artists and journalists. 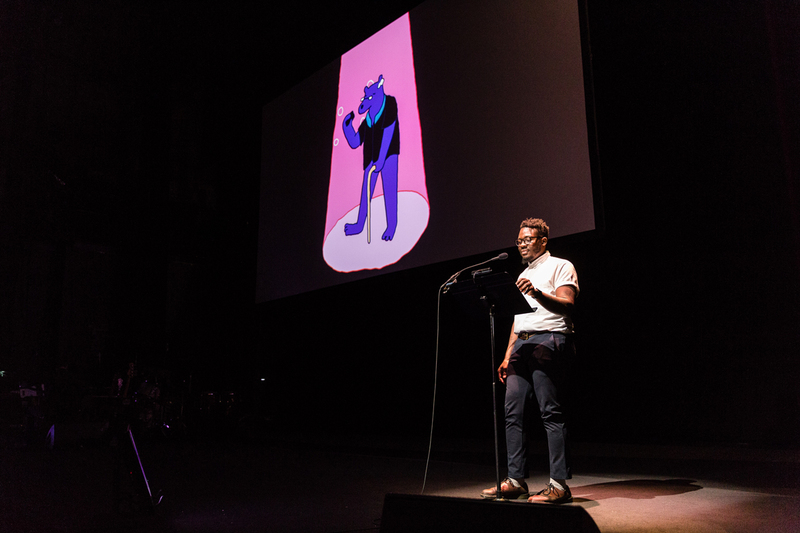 In addition to deeply reported and personal narratives, past multimedia presentations have included shadow puppets, live illustration, animation, film, choral music, photography, and other artistic forms. As in many podcasts, the stories are scored with live, often original, music performed by the in-house Magik*Magik orchestra. Sponsor segments are also presented on stage, though are clearly identifiable as ads and are produced by a separate studio. James T. Green speaks at a Los Angeles Pop-Up Magazine show. 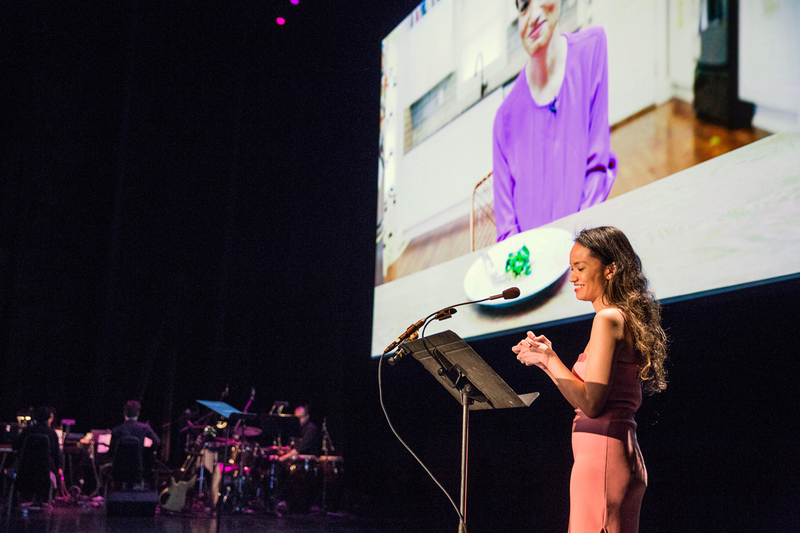 Pop-Up Magazine’s cast has included Oscar-winning filmmakers, New York Times best-selling authors like Alice Walker, and familiar radio voices such as NPR’s Kelly McEvers. This year’s performers include Will Butler of Arcade Fire, Stephanie Foo of This American Life, and Atlanta lawyer and journalist Josie Duffy Rice. Impressed by last year’s performance at the Variety, the troupe’s first visit here, Rice offered to participate—suggesting a long list of topics around her usual beat, criminal justice. Then, she says, the producer asked Rice to name something “totally random” about herself. After some thought, she admitted to being a notoriously picky eater who had never eaten a hamburger, and the rest was history. In the winter edition, Rice says her live confession is now accompanied by “extremely embarrassing” footage of her tasting various foods for the first time—a burger, spinach, string cheese, carrots, oysters. Such surprises are part of the fun, as the show romps playfully and poignantly from politics and science to pop culture and art. This year’s topics range from the ethics of Alzheimer’s treatment to the father of the electric guitar (who happened to be related to Butler). The company adds local performers like Duffy to customize the show for each city. “We really care about making the show feel like it was made especially for that audience and for that city—that it doesn’t feel like we just parachuted in,” says Edwards, who actually lived in Atlanta as a teenager. Francesca Mari speaks at a Los Angeles Pop-Up Magazine show.